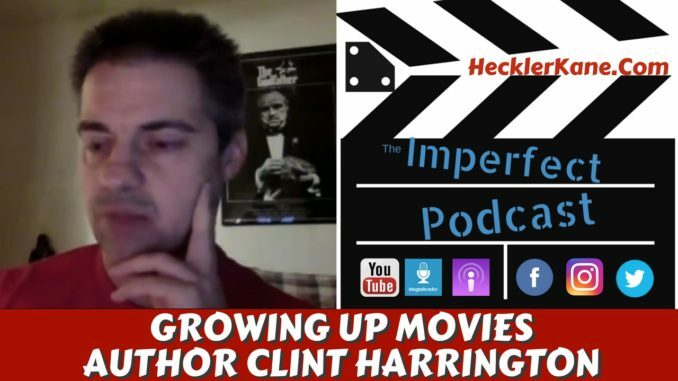 We talk everything movies with blogger and author Clint Harrington of the popular movie blog Clintington on Film. 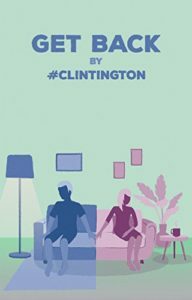 Clint turned his blog into a book called Growing Up Movies where he discusses his experiences growing up with his family watching iconic movies such Ghostbusters. For anyone that grew up in the 80s and 90s, it’s a nostalgic look at movies in an era when family entertainment was accessible. While reading his book you’ll realize how similar your memories of these movies may be and how movies were responsible for bringing the family together. When Did You Start Clintington on Film? Clint always wanted to be a writer growing up and idolized Stephen King growing up. Meeting independent author Matt Russo was a turning point. He said that if you’re going to start a blog and try and develop a platform you have to write about things that you love. He’s waiting on Goonies until his son has a bigger group of friends so he can experience it better. I love to quote Mel Brooks when I’m asked about my favorite movies. I always think of the movies that impacted me and Ghostbusters was that first movie really when I was growing up that was like I finally was allowed to be an adult. Clint thinks the Ghostbusters reboot wasn’t even close to what the original could be and I think it’s unfair to expect it to be. “I really like gangster movies but a comedy would have to be in there just because the amount of respect I have for people that attempt comedy. Comedy is so hard to do. He has a ton of respect for people that are good at comedy. Kevin Smith is one of his favorites. Blazing Saddles is one his favorite Mel Brooks movies. For Clint Ghostbusters is 1a and The Godfather is 1b. Clint grew up in what he likes to call Morman-ville USA. It’s a Southeast Idaho and its land of the Mormons. He grew up Lutheran which made them the rebels of a town like that. They wanted to be everything opposite of Mormon, which kind of led to underage drinking every now and then and those kinds of things. Clint used to criticize his parents for how conservative they were but blogging brings back memories and he realized they weren’t that bad. They let him see a lot of things probably earlier than he should. He saw JAWS at the age of 8. Where does ‘My Cousin Vinny’ rank? My Cousin Vinny will be appearing on his blog and if it shows up on my blog he liked it. He goes on to say actor Fred Gwynne’s (aka Herman Musnster) performance is one of the greatest performances by a supporting actor he’s ever seen. Marisa Tomei earned the Academy Award. It’s one of the best performances in decades for from a woman. He wrote a screenplay and I couldn’t find anyone to make it and didn’t think it would ever get made so Clint converted it to a novel. The novel is called Get Back. It’s a romantic comedy for a coming-of-age adult. He says it’s also about college relationship angst. The lead character is a guy who has been with the same woman for about seven years and then she ups and leaves right before they’re about to graduate. She’s just out of his life like that. He’s coming to terms with how to move on. It’s about loss and how he’s going to get back on with his life basically. 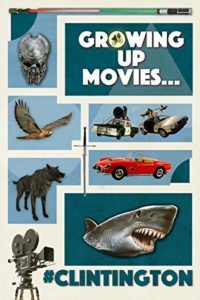 Growing Up Movies is a compilation of the blog Clintington on Film. He wanted to make the book free but Amazon won’t let you. He’s planning on doing the 90s and that would be called ‘Growing into Movies’. I held off on the Godfather for a long time because it had to be right. That movie had to be right. But Ghostbusters I jumped in earlier on that one. I wrote til like 4am I was like I’m doing it, I don’t care like I have to say this about this.